X³: Albion Prelude (X3AP), is a space trading and combat simulator from German developer Egosoft and is the latest game in their X series. An add-on to 2008's X3: Terran Conflict, X3: Albion Prelude features new content, functionality and improvements including; additional ships, stations and sectors, a new plot line, war scenario sectors and several stock exchanges. 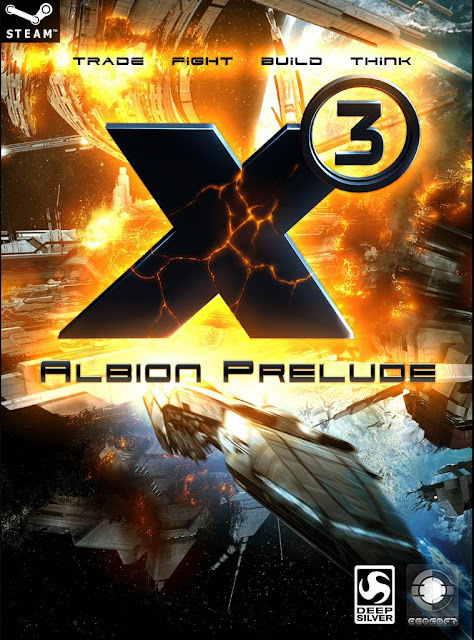 X3: Albion Prelude was announced on 08 December 2011 and released on Steam on 15 December 2011. X³: Albion Prelude plays in a time between the old and the new X Universe. It shows a universe in flux, and prepares players for things to come. The old X Universe is passing; a new X Universe is about to be created. With the war as a backdrop, corporations are vying for power and are driving the X Universe in a new direction. A technological breakthrough will soon allow massive accelerators, forming highways in space and allowing the economy to expand on an unprecedented scale. Highways, a key feature of X Rebirth, are not yet ready, but you can see them being built and participate in the power struggles around the construction of much larger self sustaining economies. # Feature overviewA new plot throws you into the power struggle between corporations at a time of war. Note: X³: Albion Prelude will not be compatible with Save Games from X³: Terran Conflict. X3: Terran Conflict is a single player, first-person space-based simulator where the player can explore and expand in a constantly changing environment. The player can navigate his/her ship across numerous sectors owned by the various races (Argon, Boron, Split, Paranid, Teladi, Xenon, Kha'ak, Terran, Pirate and Yaki) which are connected through devices termed Jumpgates, allowing for large-scale travel in the game universe. The entire game universe holds thousands of persistent stations and ships, with a varying economy which the player is encouraged to take part in through trading, construction, and in some instances combat. The game is open-ended, and the player is free to explore and perform various tasks at will, unless a mission instructs otherwise. There are several alien races which the player can interact with, through these interactions shaping his relationship with the races, becoming either friend or foe. Some races are presented as a constant threat where friendship is not an option. Each race has a military presence across the universe and skirmishes can break out without the player's involvement. The player is capable of acquiring many different types of property, such as ships, stations, and factories. Ships can be piloted manually in the first-person by the player, or can be ordered to perform various tasks on their own such as engaging in combat and trading. Ships can also be grouped together to form wings, where they attempt to perform a task assigned by the player together without the player needing to order them individually. The number of assets the player can own is not limited by the game. Types of ships range from small scout ships equipped with light weaponry and shielding to large capital ships with various capabilities, which can be used for offense, factory construction, ware production or other purposes. Combat can range from dogfights between small ships to large fleet battles involving many ships, small to large alike. There are several classes of weapons available for use, such as beam weapons, energy projectiles, ammo-based projectiles which must be kept stocked with the appropriate ammunition, various types of missiles, as well as mines. Each ship is usually capable of equipping a wide array of weapons, usually limited by the constructing race and ship size. Several space installations are available to be built by the player. They can include factories, trading stations, stationary weapon platforms, and more. The player can also build a Headquarters, capable of many different tasks ranging from ware storage to ship construction. Factories can be built basically anywhere in a sector, usually to provide income to the player through the sale of the wares it produces, or the production of wares directly for the player's use. Wares can be bought from stations for a certain cost, and be either sold at another station (usually for a profit) or to be used by the player. Certain wares are required at each type of station to produce the stations product. As an example, crystals are required at Solar Power Plants to produce its product; energy cells. Basic wares such as minerals, food, and energy go though several stages of production at various factories to become more advanced products, such as weapons, satellites, and drones. Both plot and generic missions are offered and take place in the universe itself, usually with some kind of reward for the player. Local events may alter the players experience of the mission. The majority of missions are not restrictive, and the player can perform normal activities after the mission has been accepted and may call upon any available property to help with the objective. As the game progresses, many more features are made available; such as connecting multiple factories to share resources, and training marines to board capital ships. Centuries before the events of X³: Terran Conflict, the Terrans built their own jumpgate technology, which accidentally connected to an abandoned network of alien jumpgates. They colonized many uninhabited worlds, using robotic spacecraft called Terraformers to make planets suitable for human life. A software error caused the Terraformers to malfunction and they rampaged across the colonies, re-terraforming planets, killing the inhabitants. During the last stand battle in Earth orbit, the Terraformers are drawn back through the jumpgate, which is self-destructed behind them, cutting Earth from the gate network. A small group of humans who led the Terraformers away continued to become the Argon race and the Terraformers evolved into the Xenon. The player can play the role of many characters. If an alien is chosen as a character, the player must perform an additional mission to gain access to the Solar System. After the events of X3: Reunion, the Solar System is again connected to the gate network, albeit with different sectors and alien life present. The Terran race are far ahead of the other races technologically, but remain cautious almost to the point of xenophobia. Some Terrans begin to integrate with the commonwealth sectors and a dialogue forms between governments. During a routine patrol in the Solar System, the player is called to battle in the Neptune system where Xenon are attacking. Using special beacons, they were able to jump deep into the Solar System without use of a jumpgate. During the battle, a small drone steals information from a Terran station and delivers it to an Argon ship in the Pluto sector which uses a jumpdrive to escape the Solar System. The player is tasked with investigating the odd activity of the Xenon whom appear to be under influence of the unknown character. The Xenon and pirate factions are found to be coordinating attacks to raid ships for valuable resources. New ships begin to appear which resemble the original form of Terraformers, attacking ships of the Boron race. The player aids the delivery of Terraformer wreckage to Terran scientists who deduce that these ships are remakes based on commonwealth technology. Captain Robert Pearle, an undercover Terran operative has valuable information about the origin of these Terraformer ships but he has been discovered and arrested by Argon forces. The player meets up with fellow Terran agent Patricia Heywood to rescue Pearle from an Argon military sector. When Pearle has recovered, he accompanies the player on a mission to Split space where the Terraformers are rumoured to be built. A makeshift mobile factory is discovered and captured by Terran forces and several Split scientists are captured. Under interrogation, one of the scientists mentions the name, Aldrin. Aldrin was a colony of the Terrans; established before the Terraformer war. The colonists managed to shut down their jumpgate and safeguard their Terraformers from the software error. Aldrin was presumed lost during the war. A scientist from the original Terraformer project, named Martin Winters, had survived the centuries by cryogenically freezing himself in deep space. He rediscovered the existence of Aldrin and set to work to recreate the Terraformer project using the preserved Terraformers in that sector. The Terrans launch an offensive by reverse engineering a jump beacon to jump a fleet to Aldrin. They find a Terraformer CPU ship under control of Winters, and the Aldrin people suppressed due to Winters influence on the Terraformers. A fleet of Xenon ships joins the battle against the Terrans, defending Winters. A boarding party successfully takes control of the CPU ship and Winters again makes an escape. The player is tasked with escorting Aldrin dignitaries to the Earth Torus, making the Earth sector open to the player. Four additional plot lines are available for the player to pursue. Each is fully voiced and unlocks several unique features and assets.